I am a chocolate lover through and through. Pass me the rich and fudgy decadent brownie and I am one happy girl. This recipe comes straight from my grandma’s cookbook. It is fun to make up a big batch of these and portion them out for gifts in mason jars. I love this recipe for a couple reasons. You have a brownie mix ready to go. It stores for 10-12 weeks in an airtight container. They make GREAT gifts. AND they taste pretty dang good too! PLEASE KEEP IN MIND one recipe makes about 8 batches with the brownie recipe provided. In other words…. it makes A LOT! If you are not packaging it up for gifts, I would recommend halving it. The holidays are coming up (yes probably sooner than any of us are ready for) and this is one recipe I am so excited to share with you! It is definitely a recipe to keep in mind when you want a fun gift but you don’t want to do the baking. Just jar up the measurements (I buy the big jars and do 2 batches of brownies per jar) and write or type up the brownie recipe and tie it with a cute bow :) Your neighbors will love you! All they have to do is beat some eggs and vanilla into the recipe. Easy Peasy! I love this idea as prezzies. Could even layer it and add chocolate chips as one of the layers. This is a great idea for the holidays, but vegetable shortening is so terrible for your health. Could you leave it out and add a healthy oil when making the mix instead? I'm with Suzy on this one... Love this idea, however I'm put off by the addition of shortening. Has anyone tried this without shortening (using a healthier oil instead?). suzyhomemaker, I left the shortening out of the dry ingredients then added 1/4 c. vegetable oil when I mixed them up. I hope this helps. Thanks Jeanette. That's what I figured I would do. I wonder though if adding coconut oil in the mix would work. Then one less step. The only problem would be coconut oil melts at 76 degrees. But with its antibacterial and antifungal properties I would think it would help keep it shelf stable longer. If you try it with the coconut oil, comment back. I'd love to know! This is such a great idea for Holiday gifts! It is quick easy and so cheap. Plus, not to mention delicious! 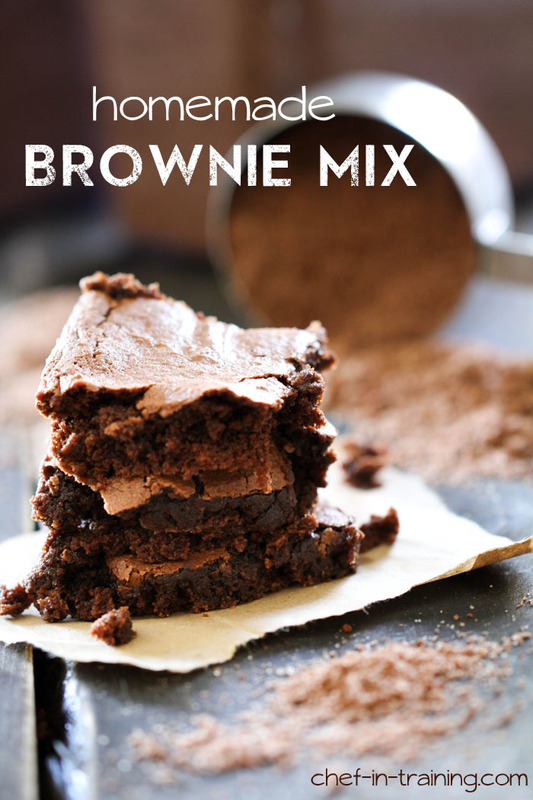 Love the idea of a brownie mix! However, I do not see any oil/shortening in the recipe! Is this on purpose before I bake a batch? Do you think that coconut oil could be used in place of the shortening? How perfect is this! I was just complaining about the store not carrying my favorite inexpensive brownie mix anymore. Then this morning, the answer to all my brownie problems! One question, are these the ridiculously chewy fudgy kind, or the cake like kind? I love giving Mason Jar Mixes at the Holiday's! This will for sure make my List! These are a perfect gift. Of course I would keep some for myself as well. Who doesn't love a good brownie? Such a fun and creative idea, Nikki! I have actually seen similar recipes for brownie mix and cake mix. Was always wondering if it worked - I guess it does! Love this! I have so many friends that I could give this too and would go over the moon for it! Sorry if I missed it but how much brownie mix do you use for each recipe? I found my answer sorry I didn't see it first few times I read thru! Hi, I did 1/8 of a batch to try before making the whole thing to store. I think the "BROWNIES" part of the recipe might be missing liquid. I added some water so that I could mix it up. Hey, it keeps for 10-12 weeks...do I HAVE to share?!?! this is so great! just pinned a recipe for homemade cake mix because i'm trying the whole "real food" thing, and this is just perfect! pinned! 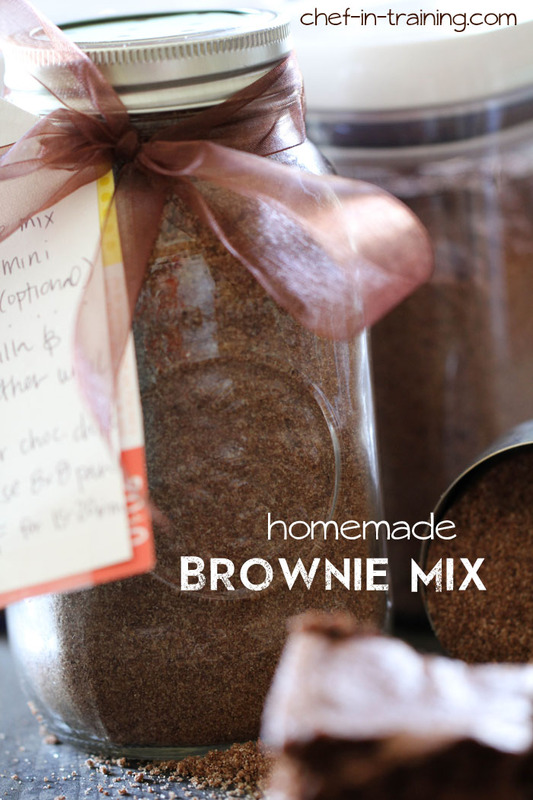 How is it homemade if you're already using brownie mix? Doesn't that defeat the purpose of being home made? The Brownie recipe is calling for the "Brownie mix" recipe you stated before. You are basically making the mix from scratch and then when you want to make the brownies, you are getting it from the brownie mix you created. Does that make since? Such a great idea for a gift! Love this! Do you use all the brownie mix with the two eggs and such, or do you use one batch (3 cups) for every two eggs and such? this recipe looks like a lot of fun to make. I found a few things that I was wondering about though. 1 comment I read before stated that there wasn't a liquid to mix into the recipe when you're making the brownies, should there be? I also was wondering about the shortening, it says an the recipe for the large batch to cut the shortening? what exactly does this mean? what size mason jar do I use for the brownie mix?